Put him in a body bag, Johnny! Must be ‘take a worm for a walk’ week! Walk on road, hm? Walk right side, safe. Walk left side, safe. Walk middle, sooner or later get squish just like grape. Here, karate, same thing. Either you karate do “yes” or karate do “no.” You karate do “guess so,” [squish] just like grape. Ah they don’t write lines like that anymore, do they!? OK down to business. 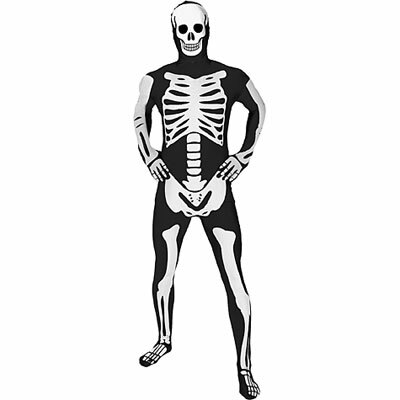 The 80s Skeleton, or Kobra Kai’s Halloween-costume-of-choice, is most likely THE most long-lived pop-culture costume of all time. 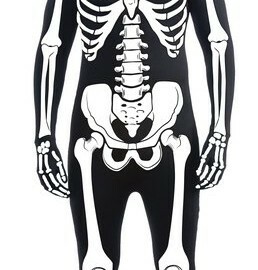 Ever since 1984, kids and adults have been wearing this full body skeleton costume and feeling awesome doing it! Even better, it’s a super easy costume to get, it’s cheap, and it’s not even a hassle to wear! Is it your turn to be the Skeleton this year? p.s. if you just want to go as one of the regular Kobra Kai members, you can’t go wrong with these t-shirts!